Specializing in high-speed open-water hulls since the 1970's, Michael Peters has perfected hull designs including semi-vee, deep-vee, round form semi-displacement, stepped and high-speed catamarans spanning a range of 10 feet to more than 100 feet and speeds from 20 knots to over 150 knots. Our yachts maintain a crisp, minimalist line. A must-see site! 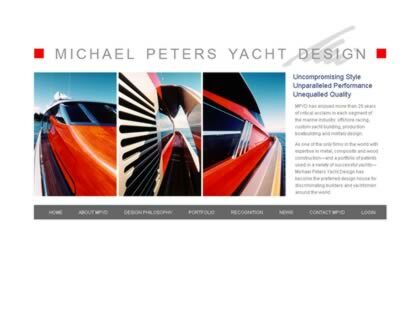 Web Site Snapshot: If available, above is a snapshot of the Michael Peters Yacht Design web site at http://www.mpyd.net/ as it appeared when this site was added to the directory or last verified. Please Note that Boat Design Net has no involvement with the above web site; all content and images depicted in the above thumbnail are the property and copyright of Michael Peters Yacht Design unless otherwise noted on that site. Description: Specializing in high-speed open-water hulls since the 1970's, Michael Peters has perfected hull designs including semi-vee, deep-vee, round form semi-displacement, stepped and high-speed catamarans spanning a range of 10 feet to more than 100 feet and speeds from 20 knots to over 150 knots. Our yachts maintain a crisp, minimalist line. A must-see site!